Hi everybody! 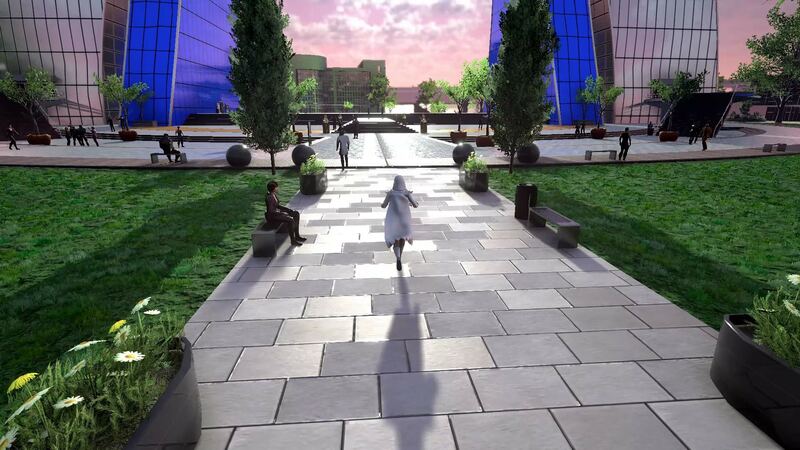 In this video Dr. Strikewell takes a little jog through the Arch Park in the center of Apotheosis City, and shows us how immersive an MMO can be once there are civilians walking around and cars driving along the streets. This video takes place in the morning, highlighting the warm colors of sunrise aboard the FHS Justice. Dawn in the Arch Park section of Apotheosis City. The cars and other vehicles on the roads of the city are obviously capable of levitation – no wheels touch the ground. We custom-designed them for Ship of Heroes, rather than buying something from a vendor and just dropping it into the game. We currently have six vehicle frames in multiple colors and exterior patterns, sort of like real-life automobiles, and we will add even more at a later date. We also intend to vary the traffic a bit in response to the time of day, as in real life. Dr. Strikewell runs between the cars. One of the key technical achievements this video illustrates is that we can have significant numbers of NPC civilians standing and walking around, without significantly harming the framerate (FPS) of the game. Civilian NPCs are vastly more complicated than things like trees and park benches. Each one is a model with a skeleton, a body, clothing, animations, and abilities. In the video, you can see that occasionally one civilian interacts with another, and leaves the conversation with a changed mood, shown by an altered animation for walking such as happy, angry, or excited. The effect is subtle and easy to miss, but it helps to make the NPCs feel alive. A variety of NPCs, dressed for different jobs, on their way to work. 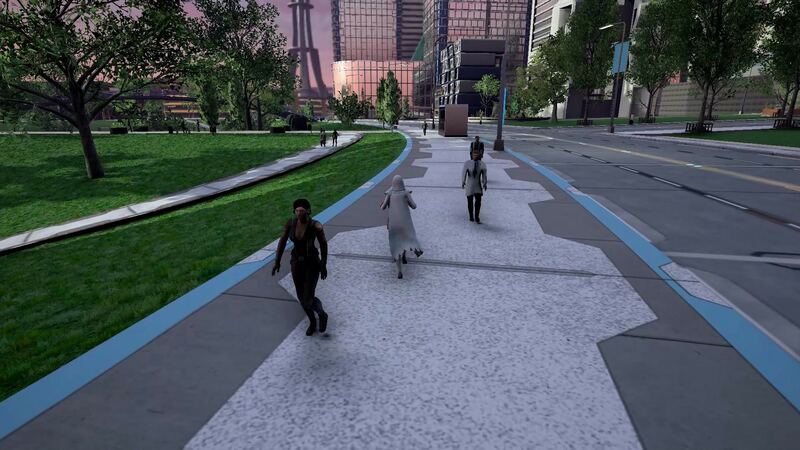 Our NPCs have jobs, so you’ll see that they are wearing clothing appropriate to their work. Office workers, people who are casually dressed, mercenaries out for a stroll, and construction workers in special clothing are all mingled into the scene. As time goes on, you can expect more and more variety to appear in-game. Our artists create almost all of the civilian clothing we show, because while it isn’t as polished as our hero costumes, we cannot find clothing with sufficiently high quality for Ship of Heroes on the commercial marketplace. group of citizens listens as one of their own speaks to them from the northeast Arch platform. One of the selling points of Ship of Heroes is that the environment is not a ruined, dystopian landscape, as it is in many other games. 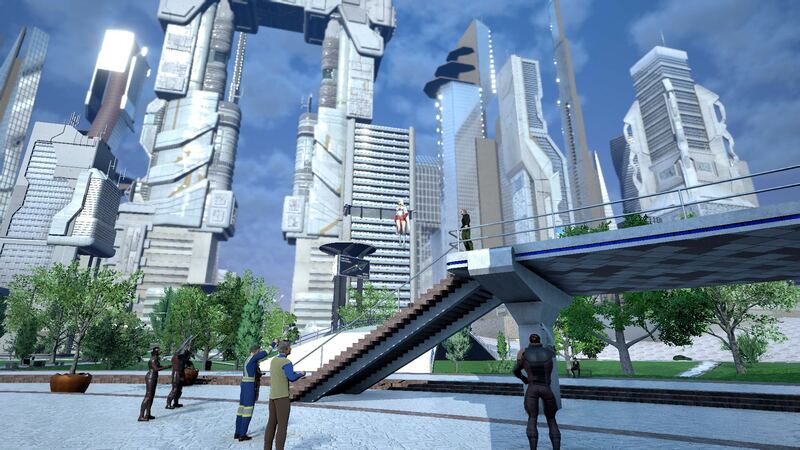 The city looks good; it is regularly maintained both by humans and by advanced machines and nanites. The challenge of our vision of the future is not that the ship is in a state of ruin or decay – it’s that the ship is a positive, powerful, dynamic place to live, one that other species would like to take from us. It’s up to heroes like you to defend it. A city and a life worth defending. We have a day/night cycle – the planned subject of a future video – so the lighting in the game changes over the course of the cycle, giving different looks to every part of the city at different hours. There are approximately 20 unique civilians walking around in this video – enough that it is not overwhelmingly obvious if any of them repeat. We plan to have a pool of over 100, and perhaps quite a few more, for launch. We have six base vehicles that we’ve created ourselves and have modified into multiple versions. The expansion of our vehicle fleet will continue over time. 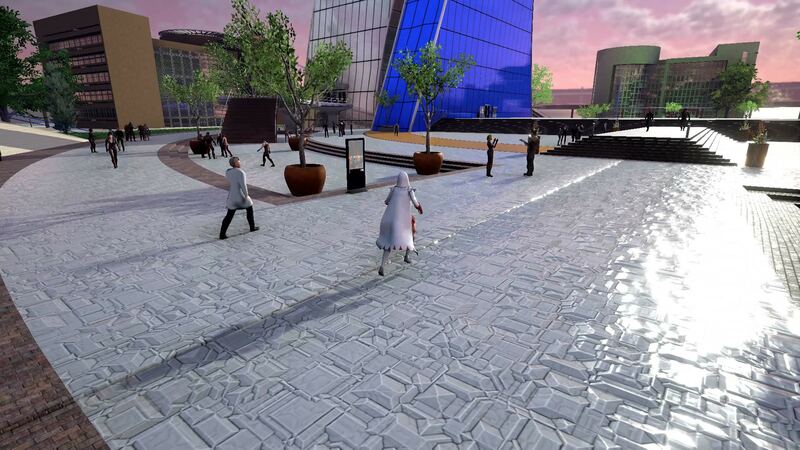 A wide variety of animations and interactions between NPCs are on display. Again, we plan to expand this base over time, but we now have a working foundation of code, art, and animations in place. Dr. Strikewell jogs through the park, in costume, in the morning light. This video was produced in-game, using a client and server arrangement, and all of the vehicles, NPCs, and costumes shown in this video were created by our Ship of Heroes team. As such, it represents an experience that any player could have in the current version of Ship of Heroes today… Although we did choose the particular footage that looks best, and this video has been purged of unexpected events – like new NPCs popping into existence in front of the camera. What really matters is that we have a character moving through the busiest part of the ship: directly under the Arch in Apotheosis City. Even in this spot, we can show literally hundreds of NPCs nearby, and keep good FPS. The minimum desired framerate for Ship of Heroes is 30 FPS, and we were consistently well above that level throughout the production of this video. In the near future we are planning to record a long-awaited video showing the day/night cycle in the city. 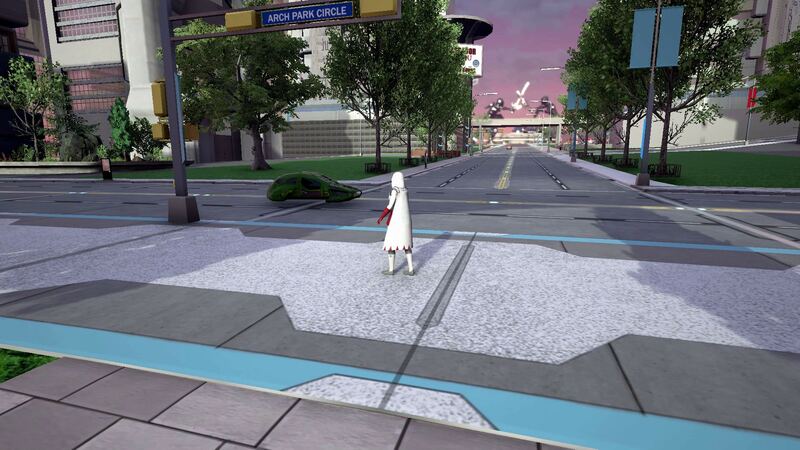 We are also working towards a Login Test to see how many heroes we can log into the same area of the Arch Park – probably absent the civilians and cars for the Login Test, as we want to stress-test the system regarding player logins specifically. Depending upon the results of the Login Test, we will likely do an engine upgrade to Unreal Engine 4.20, which has some valuable benefits for our development team. Then we will schedule a Raid Test, once we have recovered from these milestones and made all of the corrections and improvements required. Please keep following us on our forums, on YouTube, on Instagram, and on Twitter. We’re a surprisingly small team producing this game on a shoestring budget, so donations are highly prized, and all donations go directly to paying for the costs of producing Ship of Heroes. Thank you.